This is a handbook on spiritual obstetrics, written out of deep concern that so many Christians have been badly “delivered”. So often, later spiritual disease can he traced back to an inadequate initiation into the Kingdom. A better birth means greater growth in a healthy christian life. Basing his study on the New Testament, David Pawson advocates a synthesis of the ‘liberal’ emphasis on repentance, the ‘evangelical’ on faith, the ‘sacramental’ on baptism and the ‘pentecostal’ on the Spirit. He then relates these ‘spiritual doors’ to the concepts of conversion and regeneration. 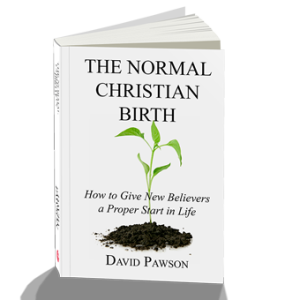 THE NORMAL CHRISTIAN BIRTH looks at crucial and controversial texts, challenging traditional interpretations. The final section on evangelistic counseling questions the adequacy of the typical ‘sinner’s prayer’ approach. Drawing from scripture and experience, David Pawson gives many practical tips on helping potential disciples to repent, believe, be baptised and receive the Spirit. The second section provides an exegetical study of two dozen crucial or controversial passages, questioning many traditional interpretations. The final section on pastoral application demonstrates the inadequacy of much modern evangelistic counseling.